Take HWY 11 toward the lovely Volcano when approaching Aloha Estates (right after the recycle center/trash) get in right lane and make a right on Mauna Kea go up 12 streets and make a right go to the end of the street as i am at the end of the street. The road is grave and easy to drive you do not need a 4 x 4. There is a house on the corner of Mauna Kea and 12th street-which lies in a tropical rainforest near Volcanoes National Park, the fresh new Lava Ocean Entry Point, the Hot Springs, Hilo Waterfalls, Famous Local Hikes, Black-Sand Beaches, Mauna Kea National Park and the Champagne ponds. We are also just a 20-minute drive from Hilo airport or a 1-hour 30-minute drive over from Kona airport. Features include absolute privacy and complete off-grid living on less than one beautiful private acre close to nature; all the while being very conveniently situated to explore the rest of the Big Island and all of its attractions already within close proximity. The house leads into a lush green garden with an expansive front lanai. The master bedroom contains 1 Queen bed with an adjacent full size bathroom, and the downstairs couch opens into a flat sleeping quarters sofa bed. The house features window views of the nature of a tropical gardens on the property. Complimentary (SENSITIVE CONTENTS HIDDEN)s, suntan lotion, aloe vera, lotion, shampoo, conditioner, body wash, water, coffee, tea, sugar, bath towels and wash clothes are provided for all of our valued guests. Use of the private kitchen, tropical gardens, living and dining room area are all included. I wanted to create a secluded place for private people like myself that is off grid completely at a very reasonable price. I enjoy my private time to read, take photos, hike and just enjoy mother nature to the fullest. So i build, designed and manifested The Tiny Jungle House. I hope you enjoy her and all she has to offer. She is built in the pyramid of Hawaii on very old cattle land from a royal Hawaiian family. She is a gift from the highest form. You will feel the high energy, the healing energy! Hawaii is an amazing destination that has everything you could ever want to do. You can go shopping in the malls and get named brands or just go to one of many farmers markets. Enjoy the Volcano and the organic food is of plenty. We have a great downtown to a small Mountain View little shopping center. We have balance in everything we do. All you have to do is enjoy. The sky is the limit. Enjoy the grounds full of solitude for your morning coffee on your private patio with not a neighbor in sight. There is so much to do i had to create a book for you. When you arrive you will see all she has to offer, it is too much to list but remember one thing. You are off-grid, you are one with mother nature so that means please do not use blow dryers, unplug unnecessary outlets and turn off all the lights when not in use. It does get cold at night so please bring warm PJ. You are more than welcome to bring the seating table and chairs outside and go to near the entry to the sitting area to meditate. Downtown Hilo is so fun. We have a farmers market, church, gift shops, wonderful eateries. Have a space heater to stay cozy! Linens are provided, cleaned and made up on the bed as well as lots of comfy blankets. Private parking in long driveway and parking on the street as well fits 7 cars. Fresh towels are provided as well as comfy robes. Big patio for yoga and meditation sitting area upon entry of the driveway upon the right. Living room has nice relaxing seating couch and of course a 1930's table as well as a single seat to relax and enjoy with oversized custom made pillows i made by hand. There is a double free standing cooler for all of your treats, food and goodies. It lasts for about 3 days with ice. Please bring your own goodies and ice. Small single cooktop stove to cook on. Coffee maker for hot coffee in the morning and night. I have sugar, cream, salt, pepper, spices etc. BBQ, cutlery to cook etc. Dining table to enjoy eating. There is a nice table with 2 chairs for dining to enjoy the evening romance. There is a TV with a VCR accompanied with movies to watch. Just encase you want to stay in and be romantic. Yes DVD player with movies. Yes, some of my favorite books are there. Chess games, Monopoly, playing cards and more. Yes, movies are there to enjoy. Large deck 20 x 20 with a wonderful hammock. I loved staying at this little jungle house so many things were unique in the house. I loved the bathroom and how it was enclosed but you could open the windows and be practically outside showering. The place was very secluded so no worries about anyone seeing you. There are a lot of outside places to sit and relax when it's not raining. The deck was large and inviting. The inside was small but cozy. You can tell the owner put a lot of thought into the small personal touches of the cabin that make it the great place it is. 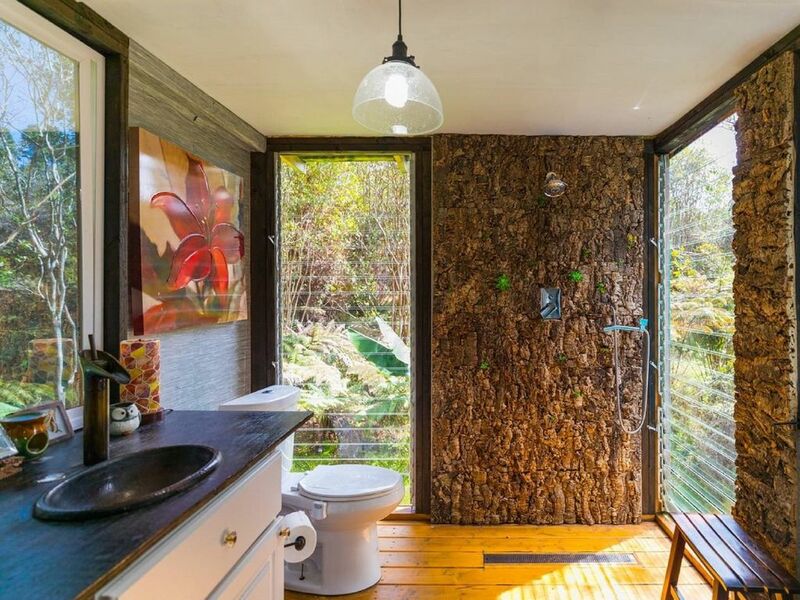 Things to consider with this place is that it is off the grid living which I found really fun to do but you will need to use a generator from time to time. The owner supplies the gas and very detailed instructions. When I first got there I had never operated one in my life but it didnt take long to be very comfortable with it. There are extra supplies readily available for your use. There is no fridge so you will need to get ice for the cooler which was more than large enough to put a few blocks of ice un and 2 to 3 days of food. It is on wheels so it's easy to take to the deck and drain the water. My husband and I stayed here for a week. It was a great get away and off the grid but with all the amenities we needed. The shower was my favorite as you seemed to be outside but not. If you're over 6' tall, could feel away little cramped as the ceiling''s low. We loved being at the end of the road with no disturbances except the comfort of the Coqui frogs at night. They put us to sleep. The bed was comfy too! The only thing we missed was an overhang on the good sized deck as it rained everyday and we couldn't really sit outside. But it was warm and we still enjoyed the warm weather and it is just water :) great place to get away from any hustle and bustle. Perfect for what we were on the Hilo side to do. Lizzy was great if needed anything (like an extra night! So sweet of her) and her girl, Linda was always available if needed. But we never needed much! All was great with a few treats and beautiful bouquet waiting for us when we arrived. Great area! More than we expected! A great place for the eco-friendly, budget conscious traveller. Everything was as described, but better. The house was clean, the bed surprisingly comfortable, a fantastic HOT shower and solar powered electricity made our off grid stay very comfortable. There were very thoughtful extras such as bath robes, a welcome gift, etc. which gave the little jungle house a luxury feel. A great spot to decompress, reconnect with nature, meditate, birdwatch, or just relax in the hammock with a book. The location was great for getting to Hilo, the volcano and just about anywhere else on the southern side of the Big Island. The road is well maintained gravel, the only thing people might have trouble with is navigating to get there. You have to count the number of streets since there are no street signs, and some of the "roads" look a bit more like walking trails as they are not used often - all the roads are equal distant apart so just make sure to count even the roads that look like trails. It is very easy and straight forward to get to, even in a tiny economy rental car. The owner was quick to respond when we had questions and was easy to get hold of. We had a great time and would definitely return again! The Volcano is just amazing, you are so close you can just go home for lunch and come back at night and enjoy it all over again. Plenty to do there, that is for sure.